#1: The best way to reach MAICh from the airport is to take a taxi. There is no direct line connecting MAICh with the airport. The taxi costs approximately 28€. There is a taxi station just across the exit of arrivals at the airport so you don’t have to book a taxi ahead. #2: There is also a local bus that can take you to the Central Bus Station in the city center (KTEL) from the airport (You can find the timetable at West Crete Bus Service website ). Bus tickets from airport to Chania city centre cost 2.50€. #2: MAICh can be reached from the city centre by bus No13. Buses leave every 20min and the bus stop is located outside the MAICh premises on the main street (Souda Avenue). Tickets cost 1.20€ one way and should be obtained in advance at any kiosk downtown. Please take into consideration that when the ticket is purchased on the bus the price rises for 0.80€. #3: You can take a taxi from the city center and come to MAICh. The cost is approximately 10€. There is a taxi station at the 1866 square about 30 meters away from the exit gate at the bus station (KTEL) on your right. 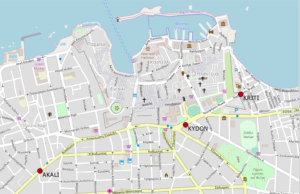 * Τhe timetable that connects MAICh with the city center (AGORA – the terminal stop as well as the departure stop from the city center to MAICh, bus No13 also departs from square 1866 which is closer to the KTEL bus station than AGORA terminal station) can be found in the Chania City Bus website”.